Elizabeth Warren is on a roll. She takes on Donald Trump on Twitter with gusto, telling him to "put on your big-boy pants." She rallies college students like a rock star. Big bank CEOs fear her. And Hillary Clinton's inner circle obsesses over "what Warren wants," according to the emails Wikileaks released that are purportedly from Clinton campaign chief John Podesta. Mere days before the presidential election, the Democratic senator's star -- and influence -- are rising. If Clinton wins, Warren will almost certainly have a bigger voice...a nightmare for Wall Street. It's a position she'll likely relish. She skewered Wells Fargo (WFC) CEO John Stumpf in an epic takedown in front of Congress when he testified over the bank's fake account scandal. She demanded Stumpf resign as CEO. He did just that. But Warren kept pummeling him on Twitter. He should face criminal charges and give back his millions, she fumed. "When she steps up and goes after somebody...she gets results," says Robert Johnson, president of Institute for New Economic Thinking and a friend of Warren's. "I think everyone in the Democratic Party is afraid of her." What really makes Wall Street nervous is how much sway she now has over Clinton. Warren has become Clinton's top attack dog, taking on Trump on Twitter and energizing crowds in key swing states. On Sunday, she dubbed Trump a "selfish little sleaze ball." When you can rally the crowds like Warren, you expect payback. 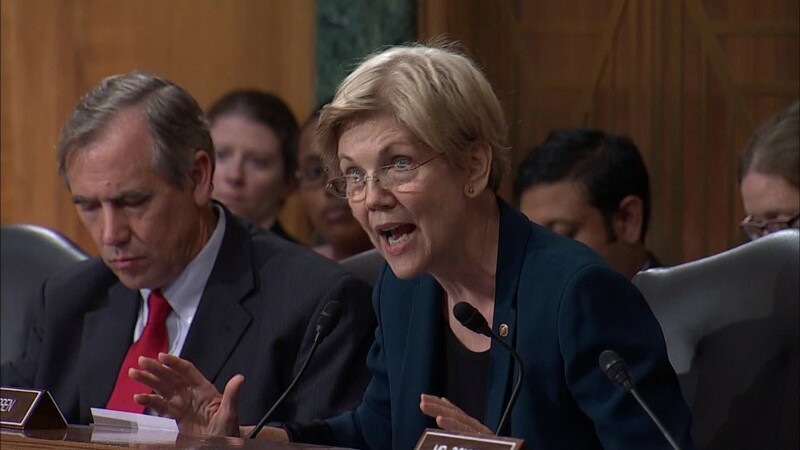 That means Warren is likely to be consulted on any key Clinton economic and finance cabinet appointments, especially U.S. Treasury Secretary and the Federal Reserve. "I think she would have de facto veto power," says Greg Valliere, chief strategist at Horizon Investments and author of a daily email tracking politics and Wall Street. What Warren wants is clear: A crackdown on banks and more help for the middle and lower class. She even advocates for breaking up banks by reinstating a law known as Glass-Steagall (which Bill Clinton repealed in the 1990s). "The market is underestimating the risk that the next Congress enacts a version of Glass-Steagall," says Jaret Seiberg, a banking analyst at Cowen and Company. "This is the one issue that the far right and the far left agree upon." Warren was the driving force behind creating the Consumer Financial Protection Bureau. It's the agency that had a role to play in uncovering the Wells Fargo scandal, among other wrongdoing. She knows policy -- and how to translated it to real people. "Her anger is rage at things that people see as unethical and unjust," Johnson says. Her name is mentioned nearly 400 times in the hacked emails from Podesta, making her a very popular topic of conversation. In one from late 2014, Warren is referred to as a "key power center" that Clinton must reach out to and appear with. Warren even made the short list for Clinton's vice presidential pick. While Clinton hasn't gone quite as anti-Wall Street as Warren has, it's clear Warren (and Bernie Sanders) pulled Clinton further to the left. Warren frequently talks about the "rigged' stock market and U.S. economy. "Government increasingly works for those at the top while more and more Americans are left behind," Warren said at a speech at Wellesley College (Clinton's alma mater) last month. It's no surprise that Clinton's latest ad states, "We have to start getting the economy to work for everyone, not just those at the top." How long with the cozy relationship last? There was some speculation that Warren might want a position herself in the Clinton White House, but it's more likely she will stay in the Senate. If she vacated her seat, Charlie Baker, the Republican governor of Massachusetts, could appoint her replacement, almost guaranteeing her seat would fall into conservative hands (at least before a special election would be held). For now, Clinton needs her. But there are questions about how long that cozy relationship will last. The two women have disagreed in the past on how many troops should remain in the Middle East, whether to try again for a single-payer health care option and the Trans-Pacific Partnership trade deal. "I think Elizabeth Warren and Hillary Clinton will be sniping at each other by spring," predicts Valliere.